Nathalie George is research director at the CNRS. She received a PhD in Cognitive Neuroscience of University Pierre and Marie Curie in 1997. She is member of the editorial board of NeuroImage and expert reviewer for many scientific journals. 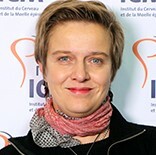 She is member of the French Society for Psychophysiology and Cognitive Neuroscience, of the French Society for Neuroscience, of the Social and Affective Neuroscience Society (SANS), and of the European Society for Cognitive and Affective Neuroscience.